This book is for the baker who wants to whip up a cake for an office party, traybake for a kid's birthday or pudding to follow a simple supper. Using straightforward, easy-to-follow techniques, there are foolproof recipes for cakes, traybakes, bread, biscuits, tarts, pies, puddings and desserts. 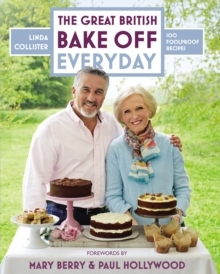 If you are a confident baker or ready to move onto the next stage, each chapter also showcases the best recipes from the series - Mary and Paul's Signature Bakes, Technical Challenges and Showstoppers, plus the best bakers' recipes from series 4. The finalists' recipes will be available after the final has transmitted in October. For more information go to: www.bakeoffbook.co.uk.